Honestly, I don’t know if I should call this thing a tart or a pizza. 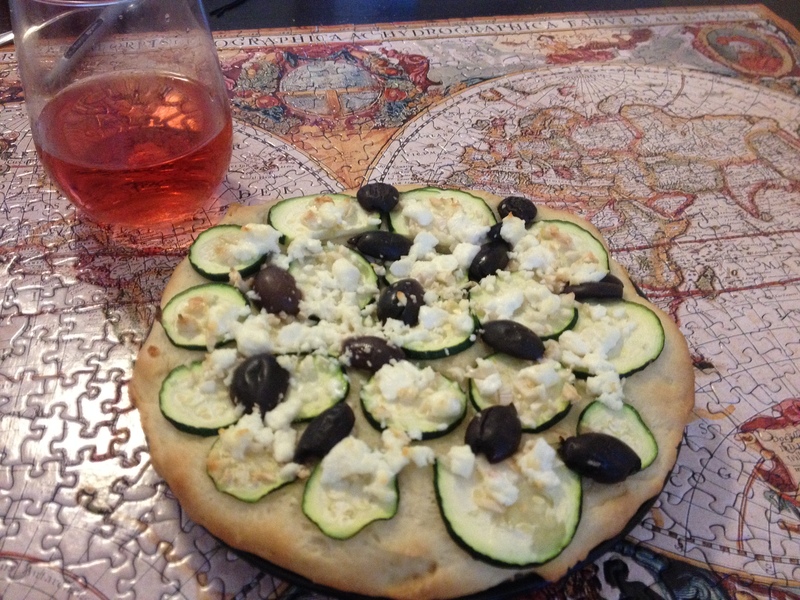 I was going to make a zucchini tart, but I didn’t want to make tart dough, I wanted pizza dough. So I decided to pull it all together like that, and make a sauce-less pizza or a yeast-based tart thing. Eh, definitions are overrated. Dissolve the sugar and yeast in the warm water, and let it sit til the yeast gets all foamy, about 10 minutes or so. Add the olive oil, and then mix in the flour, a little at a time, until a soft dough ball forms. Knead the dough until it is elastic, then set aside to rise for like an hour. This recipe will make either two little pizza-tarts, or one larger one. Adjust the toppings accordingly. Roll out the dough and put in on whatever you are planning to bake it on (pizza stone, cookie sheet, baking pan). Place the zucchini slices in a pretty pattern on the dough. I opted not to have the slices overlap, but you can do that if you want. Add the olives in the pattern, and then scatter the cheese and garlic over the whole thing. Bake at 400 for 20-30 minutes, and enjoy warm. This was actually really good. Not that I thought it wouldn’t, but I was pleasantly surprised at how well it worked. I think I could have done more zucchini though, and next time I will. I guess this was more pizza then savory tart-like. As you can see, I had this with a Vinho Verde rose, which is a great summer wine. Seriously, go with something light, fruity, and cold for this one. Song of the week: Radioactive by Imagine Dragons. It’s been fitting my mood perfectly for nearly a week now, and I just broke down and bought the album on iTunes. Summer means delicious and awesome fresh fruit! It also means delicious and awesome fresh fruit desserts. I love fruit desserts, and even on the east coast there is enough quality fruit for me to celebrate and do things with. This week, I was flipping through one of my cookbooks, and saw a sort of strawberry shortcake recipe, but with “Breton shortbread” rather than shortcake. I’ll be honest, I never liked shortcake when my mom made it. But I had fresh strawberries, so I figured I should this other version. Cream together sugar and butter until fluffy. Add the egg and vanilla and mix those in too. When they are all thoroughly combined, add the flour and baking powder (ok, I ran out of baking powder and substituted baking soda – it will work in a pinch but I don’t recommend it). Normally you would add a pinch of salt, but I cook with salted butter, so I don’t bother adding even more salt. A soft dough will form. Stick it in the fridge for a few hours. Once it has chilled, take the dough and mush in along the bottom of a pie plate or cake pan, so the bottom is covered and the dough is relatively even. Yep, mush – there is no reason to roll it out. Bake for 20-30 minutes at 350 and let cool on a rack. Once the shortbread is done, you can either a. eat it as is, b. add strawberries and sugar to it, or c. add other things, such as a strong cheese, to it. I went with option b.
Slice a bunch of strawberries,stick them in a bowl and add a little sugar. Let them sit until awhile. Once they’ve sat a while, place them on either a slice (if you are making a single serving) or over the whole shortbread if you are making it for a group. Sprinkle the top with powdered sugar and enjoy. The was very good! 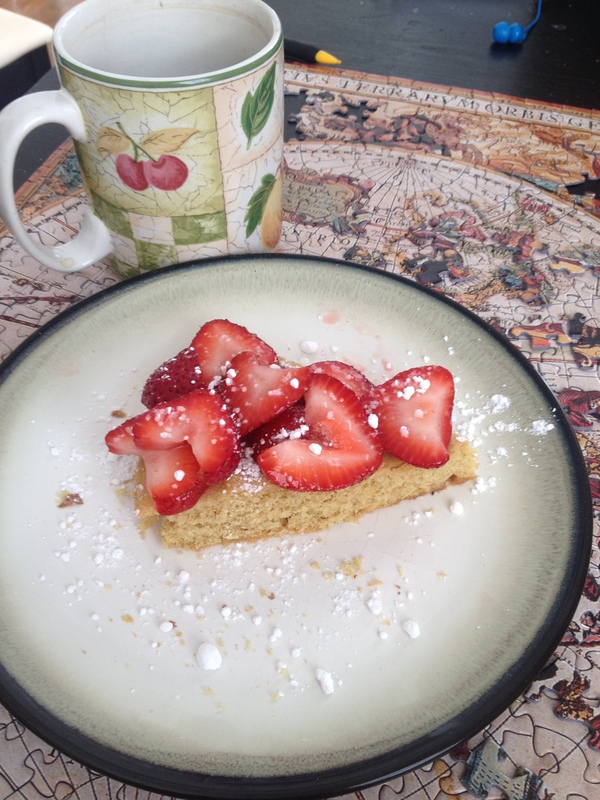 The shortbread isn’t particularly sweet, so the lightly sugared strawberries go well with it. The shortbread is, in my opinion, a bit on the dry side. So I’d like to recreate this concept in the form of a trifle. I think that would be fairly awesome. As evident from the title – have this with a cup of tea, preferably as a tea-time snack. Song of the week: The River of Dreams by Billy Joel. Just a pleasant, enjoyable song and there is nothing wrong with that. I also find it very comforting – like a song equivalent of a hug. Wash the mushrooms, remove the stems, and scoop out the gills on the inside. Mix together some olive oil, balsamic vinegar, salt, and pepper. Soak (ok “marinate”) the mushrooms in that mixture. One thing that helps is pouring some of the liquid on the inside of the mushrooms while the outside sits in the liquid. Let them soak for at least a half an hour. Heat some olive oil in a frying pan and saute the onions and garlic until they have softened. Remove the mushrooms from the liquid, and fill the caps with the onion and garlic. Then add a layer of blue cheese. Sprinkle some pine nuts on the very top. Then stick in the oven and bake at 400 for 20 minutes or so. Warning, the mushrooms will produce a lot of juice that will be all over the bottom of your pan. These turned out really well. 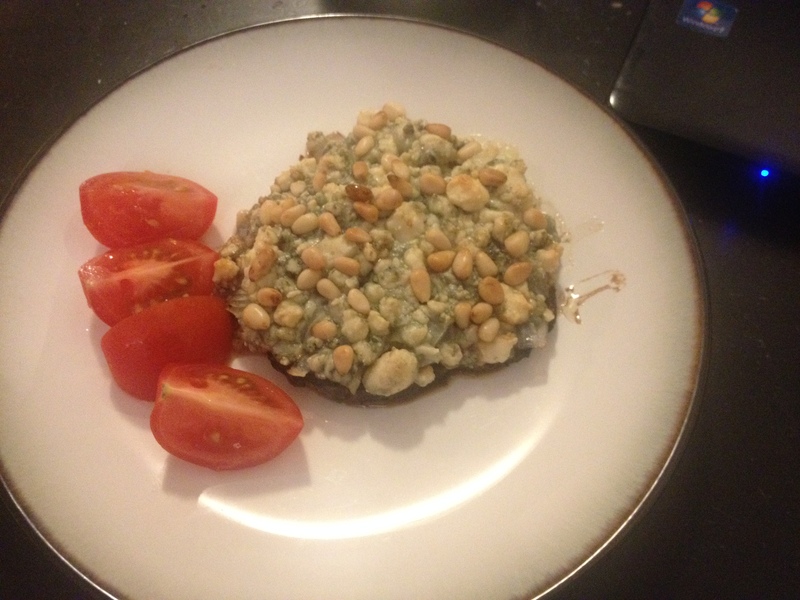 I had no real idea what I was doing, cause I’ve never actually cooked with portabella mushrooms before. It’s more of a fall dish than a summer dish though. And while I served it with a savignon blanc, I think it would go better with a full-bodied red, probably a pinot noir. One was also nicely filling all by itself, which makes it a good meal for two, or a good meal for one with leftovers. Song of the Week: Who Loves You? by the Four Seasons. The Four Seasons are usually considered a 60s group, but this is an awesome song by them from the mid-70s (and it sounds very 70s). It’s cute and fun. Brioche is amazing stuff. Admittedly, I have made brioche several times before. However, I am trying to make sure to eat healthy, so I decided this week, so modify my brioche recipe, to make it a bit healthier. Ergo, it qualifies as a new recipe. For the record, it’s not actually healthy – a loaf of bread with more than 1/2 a cup of butter in it is never going to be healthy. But it you can keep something rather bad for you delicious in the process, nothing wrong with trying to make it a bit healthier. 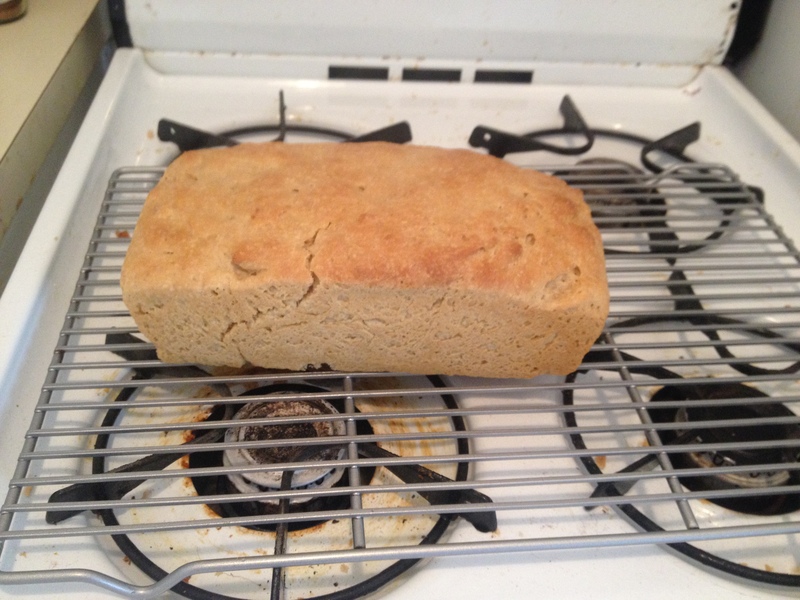 Mix 2 1/2 cup whole wheat flour, yeast, sugar, and salt together in a very large bowl. Add the water and eggs, and mix together. You can use electric mixers, I prefer to just use a spoon. The dough should be fairly soft, but not too wet. Take about half the softened butter, and use your hands to squish it into the dough. Add a bit more flour as you go so it doesn’t get too soft. As you mush in the butter, start to knead the dough. Add more softened butter as you go, and flour, until the dough is soft and somewhat elastic, without being sticky. Then you stick it in the fridge to rest and rise overnight. The next day, pull it out of the fridge and play with the dough a bit until it becomes pliable. Then shape it into a log and stick it in a greased loaf pan. Let it rise for like 3 hours or so, or until it’s doubled in size and bake for 30-40 minutes at 350. This turned out amazingly well. You can get a bit of the whole wheat flavor in it, but it doesn’t taste heavy or dense like whole wheat bread often do. It’s also more filling than standard brioche. The only quibble I have with it is that it is really crumbly. Well, that and the fact it takes forever to make – one of these days I’m going to mess around more and find a faster way of making it. Song of the week: Purple Haze, by Jimmy Hendrix. Iconic. Game-changing. Perfection. And no matter how many times you’ve listened to it (and I mean really listened) it is mind-blowing.